A below average oil pressure reading or a sudden decrease in oil pressure can be signs of serious mechanical problems, and often triggers a check gauges message or low oil pressure light. For instance, a message from the instrument cluster might read “oil pressure low,” followed by a “shut off engine” warning. Use the following guide to determine what causes a low oil pressure reading or sudden drop in oil pressure. When the instrument cluster triggers a check gauges indictor lamp or low oil pressure light, it’s a good sign that the engine’s oiling system needs servicing. 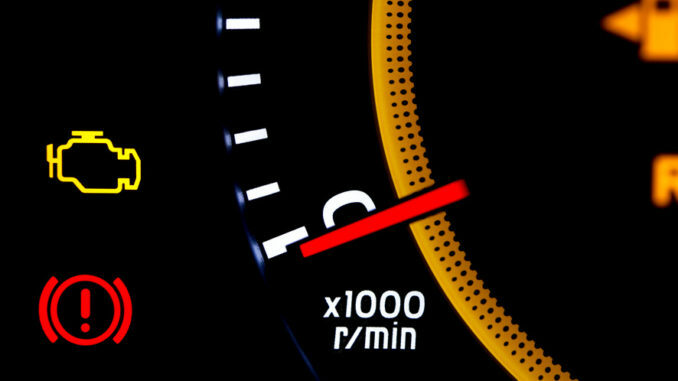 Use the following guide to determine what would cause a low oil pressure gauge reading or low oil pressure light. Correction: Check the engine’s oil level. Refill if necessary. Cause: Malfunctioning oil pressure sending unit. Correction: Remove old unit and install a new sending unit. Cause: Blockage or clogged oil filter. Correction: Perform an oil change and install a new oil filter. Correction: Remove old oil pump and install an new pump assembly. Cause: Diluted or thin oil. Correction: Perform oil change. Refer to the vehicles owners manual for correct oil viscosity. Cause: Bearing clearance not within factory specifications. Correction: Measure bearings to determine correct clearance. Refer to the factory service manual for clearance specifications. Cause: Oil pumps relief valve is possible stuck. Correction: Remove and inspect the oil pump relief valve. Replace if necessary or clean it and reinstall. Cause: Oil pump suction tube, broken, loose or clogged. Correction: Perform an inspection of the suction tube. Replace if needed or clean it and reinstall. Cause: Oil pump cover cracked or warped. Correction: If damaged exist, replace the oil pump. Upon getting this warning message, the vehicle might stall or idle rough for a few seconds. After a few seconds have passed, the warning message usually goes away and the vehicle starts idling normally. This problem often happens when the vehicle comes to a complete stop. Typically, the low oil pressure or shut off engine message has noting to do with a bad oil pump or bearing clearances. The most likely cause is when the charging system output is too low as a result of erratic idling. Therefor, fixing the idling problem will often remedy the sudden drop in oil pressure. Use the following guide to determine what causes an engine to stall or idle rough. Cause: Carbon build-up on throttle plate. Correction: Remove the throttle body and de-carbon it. Cause: Engine idle speed is too low. Correction: Inspect the Idle Air Control circuit to make sure it’s in good working order. Cause: Improperly gapped spark plugs or worn plugs. Correction: Inspect the spark plugs and replace if worn. If the spark plugs are in good condition, ensure the plug gap meets factory specifications and reinstall. Cause: Burned or worn distributor rotor. Correction: Remove the distributor rotor and install a new one. Cause: Defective spark plug cables or crossed cables. Correction: Check the spark plug cables for proper firing order. Inspect each cable for damage and replace if necessary. Correction: Test the coil and replace if needed. Cause: Intake manifold vacuum leak. Correction: Check the vacuum hoses and intake manifold gasket for leakage. For vehicles experiencing a sudden but temporary drop in oil pressure, followed by rough idle or a stalling condition, it’s highly recommended to inspect the throttle plate for carbon build-up, first. Especially for vehicles that experience this condition when coming to a stop. When there is excessive carbon build-up on the throttle plate or surrounding parts it will prevent it from returning fast enough to maintain proper air to fuel ratio. As a result, the engine will either stall or the RPM will drop suddenly and cause the charging system output to drop too low. When this happens the instrument panel will trigger multiple warnings, such as "oil pressure low” or “shut off engine. Some vehicles will also trigger an audible warning tone. NOTE: This troubleshooting guide is specific to the 2001, 2002, 2003, 2004 Dodge Ram 1500, 2500, 3500 trucks equipped with the 3.7L, 3.9L, 4.7L, 5.2L, 5.7L, 5.9L, 8.0L, and 8.3L engines.